Steve Paterson drives hard on his way to fourth place and promotion to Category Two level on the street circuit at Doncaster. The festival features the first of the major local city centre races on the cycling calendar, and is always a top event. Dean Watson on his way to a superb ninth place in the elite race. 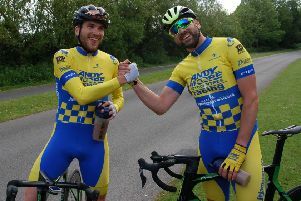 But this year, added interest was provided by the appearance of Team Wiggins, run by former Olympic hero Bradley Wiggins, and one the UK’s finest riders, Tom Pidcock. Other leading teams were also there, so it was quite a handful for the Andy Moore Autocentres/J.E.James Racing Team to cope with in the elite race. Manager Andy Moore likened the challenge to “building a car in the garage and taking on Lewis Hamilton in Formula One”! However, the Moore boys performed remarkably well, with Dean Watson (pictured, inset) somehow getting among the placings in that elite race, newcomer Freddie Bingham putting in a superb display, as if he’d been doing it for years, and Steve Paterson and Jono Dexter working well together, with the former producing a storming to ride to finish fourth and gain promotion to Category Two level. Even veteran Andy Bishop did an awesome job, even though he had to ride through the pain barrier with a back injury. The day before the race, he couldn’t even sit up properly! Sunday’s weather produced an afternoon scorcher, matched equally by a blistering contest of racing in each of the Moore squad’s three races. Bingham was the first to sample the challenging Doncaster street circuit, making the event his first ever City Centre Criterium, and with the eyes of several thousand spectators upon him, the rock-star-turned-racer produced a solid, accomplished display of riding that disguised a lack of race experience. The Natterjacks front man rode home to a creditable bunch finish, having once more been thrown in at the deep end. In the second of the day’s races, in-form Paterson joined forces with Dexter, and the pairing produced yet another quality performance to bring Paterson an excellent fourth place spot, demonstrating his consistency. More importantly, the result secured promotion for the rising star. 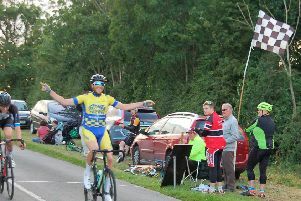 The grand finale of the day was the elite level event, and with a field of top-level opposition, the trio of Aaron Chambers-Smith, Andy Bishop and Dean Watson were faced with a David-versus-Goliath contest, such was the quality of the peloton. Watson found himself in the main peloton with the break vanishing fast up the road. A determined effort from the Staveley team rider produced the highlight of the race, with Watson making his way back to the front group. With the attack group now comprising 11 riders, the advantage quickly gained ground, and the chasing peloton had no success in closing the gap. Despite the lofty competition, Watson looked comfortable throughout, and as the final attacks came with one lap to go, the Moore rider battled hard to come home in a superb ninth place. Manager Moore expressed his pride at the team’s efforts, saying: “Once again, the lads have shown that determination and spirit which drive us on to achieve the very best performances. Freddie rode well, and you’d never know he’s raced only a couple of times. He showed outstanding composure. “Patto had great support from Jono, and to finish fourth and secure promotion so early in the season is a fine reward for his efforts. “Deano rode his heart out, and with Bish and Smiffy supporting, he rode one of the best races you’ll ever see. Riding against this level of competition and finishing ninth is a great achievement.